He’s already won a state championship in wrestling. Now Bucksport’s junior tackle wants to win one in football. Courtesy of Rick McHale Sr.
Bucksport High School two-way lineman David Gross. BUCKSPORT, Maine — It didn’t take David Gross long to make an impact on Monday night’s Class D North football semifinal. On his first defensive play of the game, the Bucksport High School junior tackle burst through the line of scrimmage and slammed Mattanawcook Academy running back Diondre Duffy to the Carmichael Field turf for a five-yard loss. Duffy is not the first opponent victimized by either Gross’ athletic instincts or his 6-foot-2, 320-pound presence, whether on the football field or a wrestling mat. 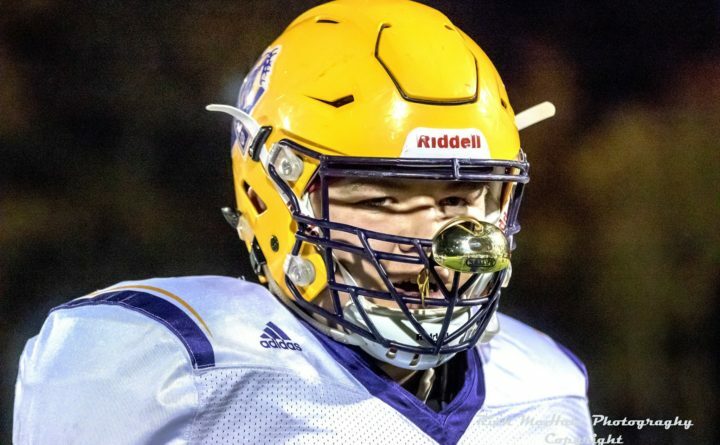 “I know I’m biased,” said longtime Bucksport High head football coach Joel Sankey, “but I think he’s probably, if not the best high school lineman in the state of Maine, then he’s got to be among the top three or four as a junior. The Golden Bucks’ big man also is just rounding into good health for the first time in nearly two years and that’s good news for an 8-1 Bucksport football program that will play 9-0 Foxcroft Academy for the regional championship Saturday night. Game time is 7 p.m. at Oakes Field in Dover-Foxcroft. “It’s been huge to have him back,” said Bucksport senior halfback Carter Tolmasoff, who ran behind Gross and linemates Nathan Russell, Julian Shook, Owen Gaudreau and Gavin Billings for 380 yards and five touchdowns in the Golden Bucks’ 77-36 victory over MA. Gross arrived at Bucksport High in the fall of 2016 and immediately established his athletic credentials in wrestling. He not only won the Class C 285-pound state championship on his home mat but became the first freshman to win the overall Maine heavyweight title by capping off an undefeated winter against instate competition by winning his weight class at the state’s New England qualifying meet. Gross’ fortunes changed dramatically during his first match at the 2017 New Englands, as he suffered a dislocated kneecap but nearly won anyway before dropping a 10-8 decision to Joe Townsend of Tri-County Regional Technical High School in Franklin, Massachusetts. That marked the end of his wrestling season and the beginning of rehabilitation to get ready for his sophomore year of high school football — only to have things eventually get worse. “We were playing the second quarter of our John Bapst preseason scrimmage at Husson (University in Bangor) my sophomore year, and one time I was getting up and planted hard and something snapped in there,” said Gross. He not only played through the injury but was the dominant lineman in the Little Ten Conference. Gross capped off his sophomore season by earning first-team All-LTC honors on both offense and defense, and he was named the league’s 2017 Bob Carmichael Defensive Lineman of the Year while helping the Golden Bucks reach the conference championship game. It was only after the season ended when Gross found out exactly what happened inside his knee. He was diagnosed with a torn anterior cruciate ligament, a partially torn meniscus and a torn medial patellofemoral ligament. Gross was unable to defend his state wrestling championship and underwent surgery last Feb. 9, and his subsequent recovery was boosted by the support of his teammates. Rehabilitation this time enabled Gross to return to the gridiron midway through the 2018 season, although initially only on offense. He made his debut during a Week 5 regular-season game against Mattanawcook, which the offense-minded team won 50-36 and foretold their postseason rematch. Gross since has worked his way deeper into the Bucksport game plan, adding a full defensive load to his offensive assignment this week when Tolmasoff and fellow senior running back Lucas Wardwell combined for 584 rushing yards and 10 touchdowns. When the football season ends for Gross, which he hopes won’t come until after the Class D state final on Nov. 17 at the University of Maine in Orono, his attention will again turn to pursuing wrestling prominence. That effort will be the watchful eyes of his father, new Bucksport High wrestling head coach Dave Gross, himself a 1996 wrestling state champion for the Golden Bucks. But as the younger Gross pursues continued excellence on the mat, it’s with anticipation for a full and healthy senior season of football come 2019. “I like wrestling, and winning the state championship was one of the best feelings ever, but for me it’s football 110 percent,” he said. “My goal is I want to play football at the next level. It’s hard coming from Class D, but football’s always been my No. 1 sport.